If you’ve made it this far and you’re beginning to read this article, then I’m assuming you already have a pretty good idea of what deep frying it. While not the healthiest option to cook, it’s important to know what types of oils you should use to help make the experience as healthy as possible. This guide will help you find the healthiest oil to use in the deep fryer. In addition, you’ll know what oils you should absolutely avoid using at all costs. The first and most important thing that you need to consider is the temperature that the oils is going to be able to withstand. The temperature of the oil when deep frying is critically important so you want to make sure that the oil can be heated to the temperature you need it to be at. When you choose an oil, try and find an oil that consists of mostly monounsaturated and saturated fats because those oils are going to be stable at the higher heats. Related: How do You Know When Oil is Hot Enough to Deep Fry? When it comes to trying to find the healthiest oil out of all the oils, the clear winner is going to be coconut oil. As a matter of fact, there are plenty of studies that show coconut oil will not deteriorate in quality even after 8 hours of continuous frying at a consistent temperature. Furthermore, 90% of the fatty acids in the coconut oil are saturates which helps improve its resistance to heat. In addition to all of that, you will find a plethora of health benefits to using coconut oils such as killing bacteria and viruses and even losing some belly fat! Try a couple different brands however because some of them are going to leave behind a coconut taste. While coconut oil is a great choice and the best choice, there are plenty of other good options that you can choose from as well. If you’re like most people, then you already know that olive oil is one of the healthiest oils that you can find. There are some studies that showed olive oil can withstand 24 hours of continuous deep frying. The problem, however, is that it might not hold the flavor or fragrance for that long. Peanut oil has a pretty high smoke point so that it can be used to fry at high temperatures as well. 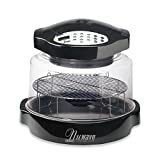 This is one of the most popular choices for deep frying oil because it does not absorb the flavor of the food so you can fry several different foods in it. Additionally, it has a neutral taste. While it is a great choice for a variety of reasons, it is one of the worst oils out of the healthy ones listed above. Palm oil is another great choice for deep frying because it consists of the right fats and the flavor is neutral as well. The problem is that there are questions whether or not the harvesting of palm oil is sustainable. This particular oil is pretty similar to olive oil in that is is made up of a lot of monounsaturated fats with a few other types mixed in. It has an incredibly high smoke point so that you can fry with it at high temperatures and it may leave behind a slight nutty taste. While there are a lot of great recommendations that are mentioned above when it comes to finding a great oil to use for deep frying, it’s important to know that there are also many oils that you need to avoid using at all costs. This includes vegetable oil! These types of oils are typically extracted from seeds and the processing methods are incredibly harsh and they are also high in polyunsaturated fat. In case you are wondering what oils this includes, the following is a complete breakdown of what you should avoid. If you ever have the choice, you should avoid using the above oils at all cost. If those are the only oils you have around to use, then the best thing to do would be to skip the deep frying until you have a better oil to use. Despite trying to find a better oil to use, it’s important to understand that no matter what oil you use, your food is still going to be higher in both calories and fat. To avoid consuming too much fat, you may consider using an air fryer. There are many affordable air fryers in the market, but an air fryer may not make food as crispy as a deep fryer does. Learn more about air fryer reviews. If you compare air fryers’ and deep fryers’ benefits and decide that you are going to use the deep fryer, that is when you should try and consider some of the healthier options when it comes to the oils. Additionally, keep the cooking time at the minimum needed to cook the food properly and you will reduce the calories the food absorbs from the oil.